I am loving the fact that the weather is cooling down. This weekend is supposed to be really lovely with highs right above 80. Jazz hands. 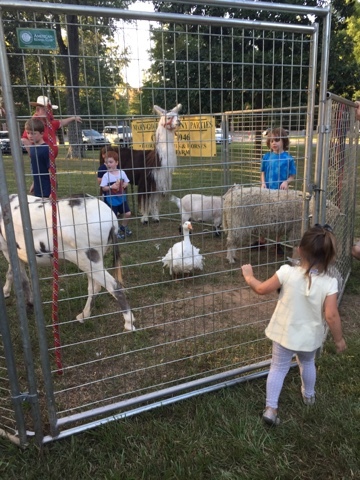 We have a great park around the corner that's completely fenced in with lots of different equipment for the little ones. 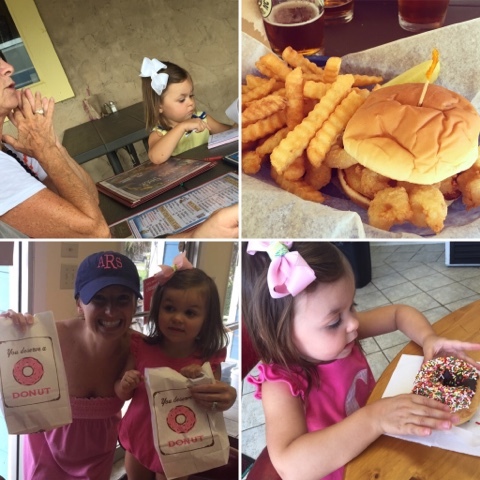 One of our favorite activities is to pack a lunch to bring to the park (or, some weekends -- donut holes!). 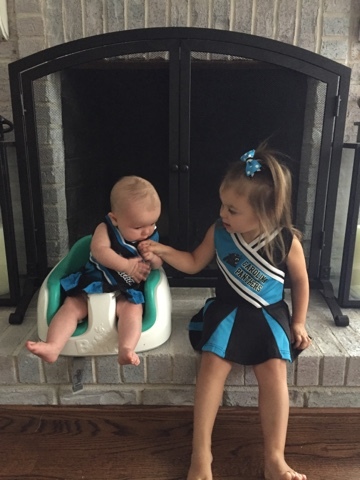 Charlotte, being only 5 months old, is obviously too young to play, but she can take it all in and watch her big sister run around the equipment screaming out the "Let It Go" lyrics. The nice folks at JJ Cole sent me the Bundleme and Bundleme Shearling Hat to make our fall and winter activities a little cozier for her. I'd seen this product before but never purchased one for Camille. I can truly tell you that this product is a must-have for cold weather. It's fleecy and warm and just ... plush! It secures to your stroller with velcro and you can use your buckles and straps as you normally would. Big fans here. This past Wednesday night I went with some girlfriends to Village Tavern for dinner. They had half-priced wine ... I had the most delicious glass of Kim Crawford sauv blanc for $5! It was honestly nice having a reason to get dressed up cute and reapply some blush. AND drive at night by myself. That was always one of my favorite things as a teenager -- driving my car at night with the windows down and sunroof back. 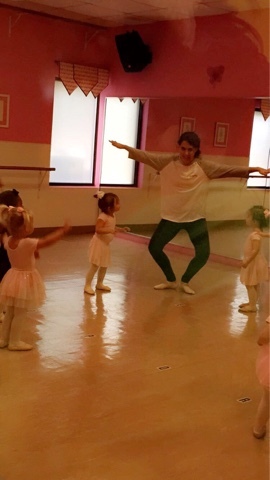 Camille has been loving her ballet class. Watching her through the smoky window is a definite highlight of the week! 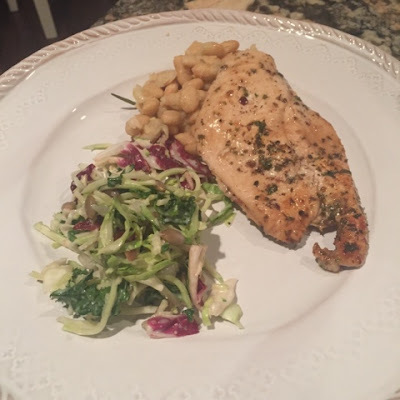 Last night I hosted supper club at my house and cooked a dish that is a WINNER WINNER WINNER. 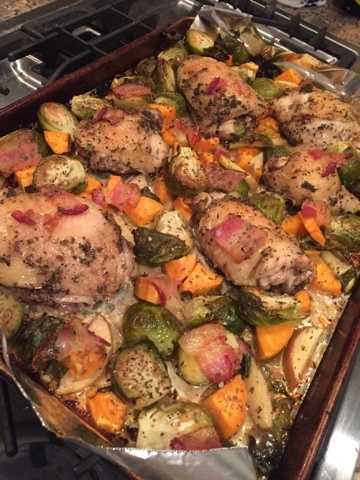 You can find the recipe here for this one-pan autumn chicken dish. I loved having something that cooked all together so that I could spend time with my friends. I served it with warm crockpot applesauce and we also had biscuits. We had Southern Living's Pumpkin Crisp for dessert -- I've blogged that recipe before and you can find it here. Seriously a wonderful recipe that I will be making again soon. Don't miss these recent posts and an opportunity to win a gift card! 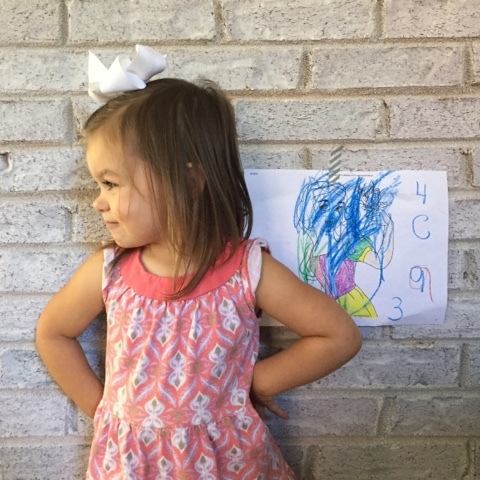 Charlotte, you are FOUR ... now FIVE (!) months old. I missed her four month update, and am two weeks late in posting her five week update, but it's only because I've been staring into her sweet angelic eyes every waking moment -- and getting us settled in our new home. We are so busy these days! Charlotte is a joy, joy, joy. Seriously a wonderful baby. She is happy and relaxed and calm. I saw these traits in her little face the minute after she was born on April 14th. They placed her on my chest, she immediately calmed and snuggled, and I knew this would be my little snugglebunny sweetheart. She is an awesome sleeper. Over the last few months, we've pushed her bedtime back from 9:30/10 to a more traditional baby bedtime of 7:30pm. I usually get Camille down at 7 and then turn to Charlotte -- nurse her, change her into jammies if she's not already in them, sing Twinkle Twinkle to her, and place her in her crib. She's sleeping through the night still which is so amazing. 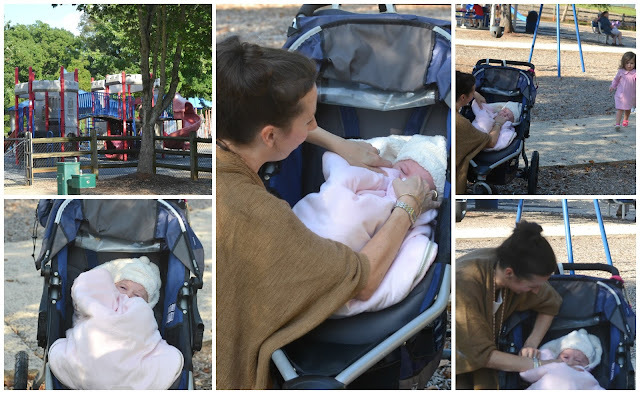 It took Camille until 6 months old to do that, and Charlotte started doing it around 3 months. She's wearing size 2 diapers and 3-6 month and 6 month clothes. She started rolling over at the beginning of August (right around 4 months), then sort of lost interest in it, and now is rolling back/front and front/back like a champ. This baby is on the move and life is about to get a little crazier! She's not a loud baby in the least, but she's experimenting more with her sounds. When she wakes up in the morning, instead of crying, she just plays quietly and coos a little. It's the sweetest thing to behold. She and Camille are getting along awesomely. Lots and lots of reminders to big sister about being gentle with her ... LOTS. But Camille can really get Char giggling, and vice versa. It's the best. Camille likes laying down next to her on a blanket or quilt and helping me during diaper changes. And what we loved at one month old. Last week some of you seemed to enjoy seeing our weekly meal plan, so here it is for this week! Thursday: I host Supper Club here (also postponed from last week to this week). Will share the menu next week! So, food this week will be pretty easy. Camille gets a packed lunch twice this week since she'll eat at preschool, and I'm going to take my friend Sarah's idea and spread hummus between two slices of wheat bread. The school is nut-free, so no PB&Js. 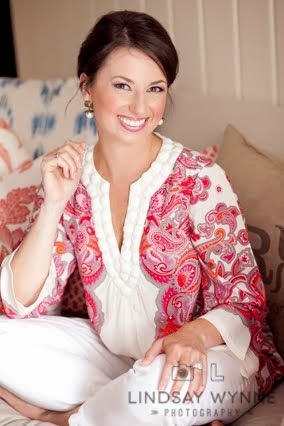 My friend Justine, who writes over at Full Hands Full Heart, has recently started selling Thirty-One. You're probably very familiar with this line of bags, totes, and accessories. She has been such a help to me with assisting me in deciding which bag suits my needs. Ultimately I went with the Large Utility Tote (and took advantage of their September special to get the stand-up insert for $15, reduced from $50). I see so many uses for this ... park picnics, packing for weekends away, car trunk organization, Aldi shopping trips! 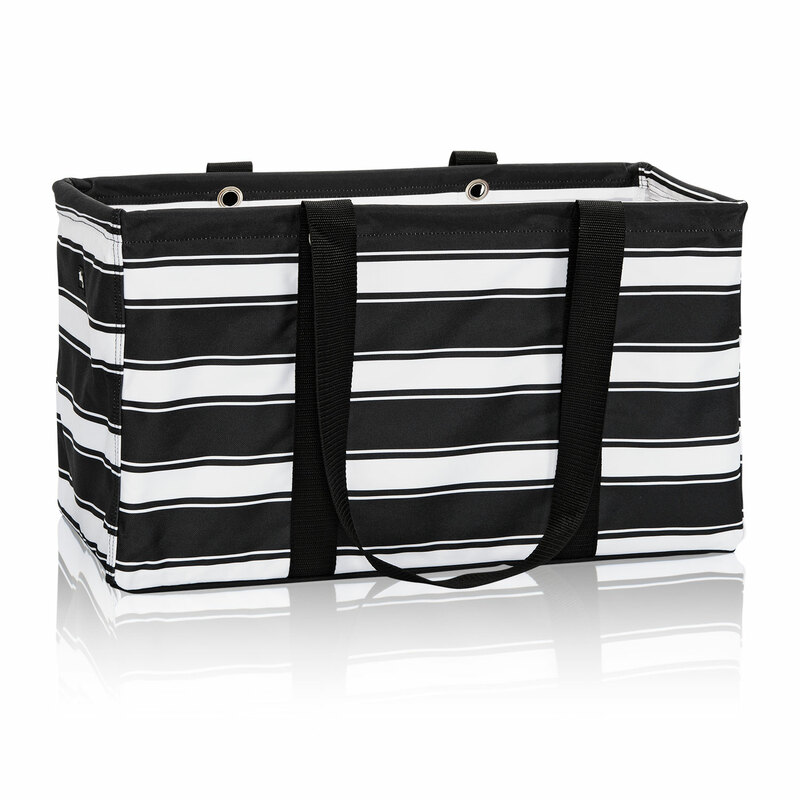 I love black and white stripes so this pattern was a no-brainer. But they also have a really awesome red and black check pattern that I almost purchased. If you are in the market for some new totes, lunchboxes, teacher gifts, Christmas gifts - I know Justine would love to help you. She has been such a great friend to me and I know you will love getting to know her too! She's a mom of five, and therefore an ORGANIZING QUEEN, so she can really point you in the right direction! You can shop the whole line here. The September special I took advantage of is only good for a few more days! We had a great and full weekend. Friday night, we had dinner with friends of ours at the local pizzeria. The pies there are huuuuge and delicious. The husbands wanted to head next door for a beer at the sports bar while we girls took the babies two doors down for frozen yogurt (who am I kidding, I was really the one who was craving some marshmallow froyo with Butterfinger and cookie dough on it). Crazy thing was, one of the biggest stars of the Panthers football team was also there with his family. 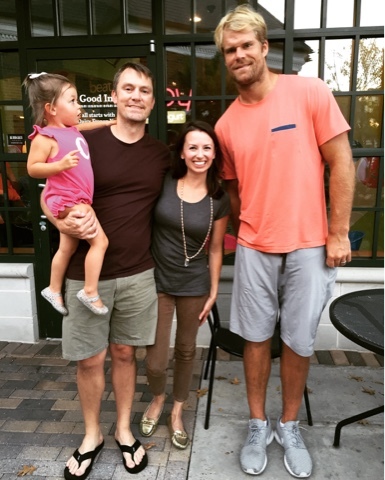 We snagged a pic with Greg Olsen ... he was so kind. Saturday we went to visit some friends to watch the ECU game. 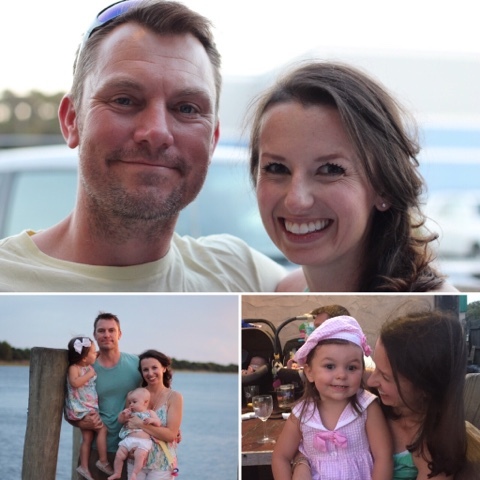 Camille loves their daughters (they are older than her) and had a blast playing with their Barbies! We munched on smoked wings, shrimp cocktail, a veggie tray, steak stuffed jalapenos, and (my favorite) buffalo chicken dip. 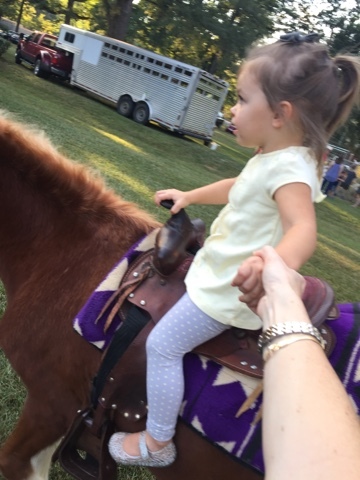 That evening, Ian stayed at home with Charlotte and I took Camille to a fall festival where she got to ride on a pony and take a hay ride! She was scared at first of the hay ride but then really enjoyed it. 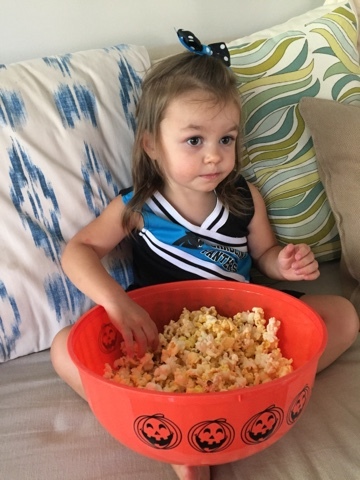 Ian scored last-minute tickets to the Panthers game yesterday afternoon, so I stayed at home with the girls and we played and watched the game on TV. I was worried about him being downtown yesterday with all of the unrest going on in Charlotte, but he said it was completely peaceful and safe. I think our city is on the upswing and ready to make some forward progress. It's hard seeing the city you love (and describe to others as being such a friendly, safe, Southern-hospitality spot) being highlighted on the national news for all of the bad and scary stuff going on. It was positively unrecognizable last week. Last night we got the girls in bed and relaxed with some lamb gyros from a nearby Greek spot. I made some oven fries and topped them with lots of oregano and garlic powder for an extra kick. They were DELISH with the gyros! Hope your week is off to a great start. 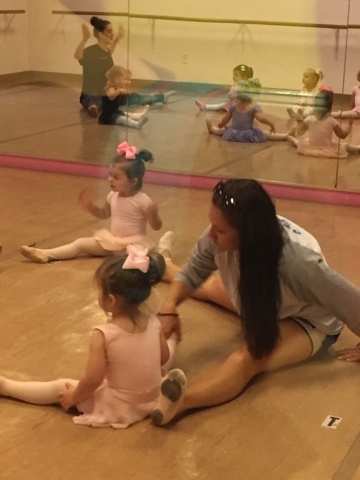 It's time for us to get ready for Camille's weekly ballet class! I have so many fun skincare updates today that I thought I'd share here under the 5oF theme! So you know I've talked a good bit about Grove Collaborative. This is the company that stocks earth-friendly household products and ships them monthly to your door. I'm am Amazon Prime NUT, so why order from a secondary company? Well, their prices are awesome (just as good or better than Amazon in many cases) and I also love supporting a company that's taking active steps toward a better, healthier planet. I became an "influencer" with them since I love what they are doing so much ... if you are a blogger and are also interested in being an influencer, shoot me an email, I'd love to connect you with them. 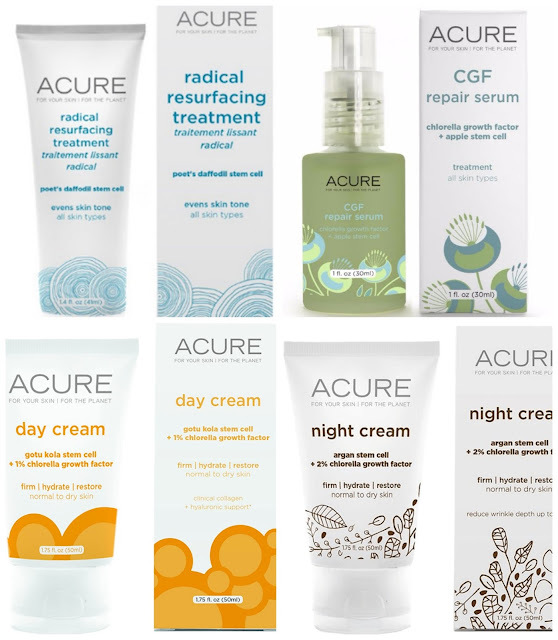 Buying from Grove Collaborative has also turned me on to the Acure line of skincare products. More on that below. But I did want to tell you that if you're a new customer, you can use my referral link here to get $10 off of your first order and a FREE Acure shave gel. A few of you have emailed or sent me a chat on Snapchat about eyelashes. Since I'm nursing Charlotte, a lot of the REALLY fun options are currently out (ie, Latisse, which I used years ago, or Neulash, which is on my wishlist next). But I have to give all of the credit to my fave mascara by L'Oreal -- this one. I get it in Blackest Black. It seriously plumps up my lashes like none other and is like $7-8. Using this before skin serums is supposed to help the serum penetrate your skin better and give you a collagen boost. I'll take it! I also have to throw this one skincare anecdote in there. Earlier in the season I posted a photo from the pool and had a few people to email me about a mole on my chest that looks pretty scary. It was a crazy time (newborn days ... or should I say newborn daze) and I did take the time to write back to some people but not all. I have had some guilt that some of you never got a response from me and I didn't want you to think that I was not appreciative of your concern and the time you took to email me. I've had that mole since I was born and I do have it checked regularly by a dermatologist ... several different derms have said "not a worry on that one." I have had a mole removed from my back -- back when I was in high school. NOW, it has been two years since my last derm appointment so I'm overdue to have it checked. But I give you my word that I will remain diligent in getting it checked out! And truly, for those of you who emailed me, thank you! It was looking for a while like a beach vacation wouldn't happen this year. 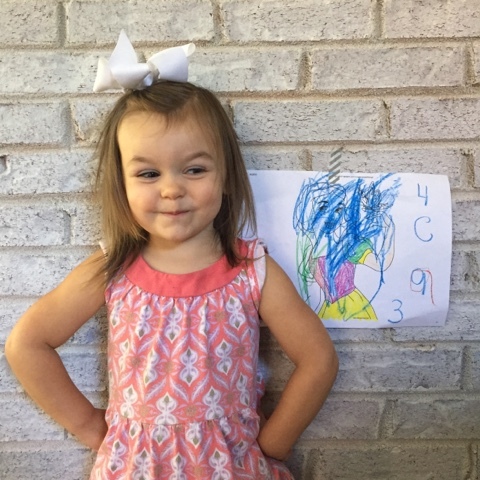 We had two babies arriving in the spring, my parents' home was up for sale and they are building a home, and our home was up for sale and we were looking for a new home. Just lots going on and the vacation was taking a backburner. My husband and brother-in-law got on the phone together though and found a great ocean-front home for us and made it happen. Love it. 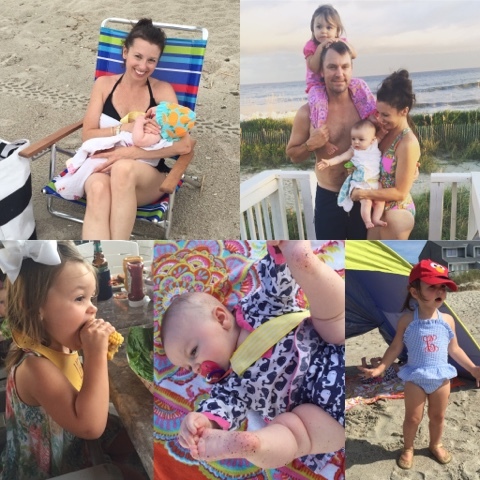 Here are some photos from our trip as well as some things I learned about beach travel with two little ones. And of course, fun things to do at the beach! Oak Island is 3.5 hours from our Charlotte home. Not a bad trip with two kids. We left in the morning (9/10ish) to head that way and also return home. Both times Camille ended up dozing a little in the car in the morning and not really taking an afternoon nap. It's okay ... vacation, right? Charlotte slept almost the entire time she was in the car -- #angelbaby. We stopped on the way to the beach at Cookout for lunch. Camille had chicken nuggets and fries (my OCD tendencies about her eating healthy have slightly relaxed, would you say?). On the way to the beach and back I hopped in the backseat and gave Charlotte a bottle of pumped milk and THIS is where I can't sing the praises enough of my manual pump (this one) which needs no electricity. It's the best and I've only used my electric pump once in five months ... the manual one always wins out for simplicity. If you're nursing, these are awesome, awesome, awesome for car trips. I also used it a lot back when I was working if I needed to pump during the day and wasn't sure if I'd have a power source. Like, in a client's restroom. Fannnncy. So, babies on the beach. The idea is adorable but the truth is that you've got to get a bomb umbrella for shade. 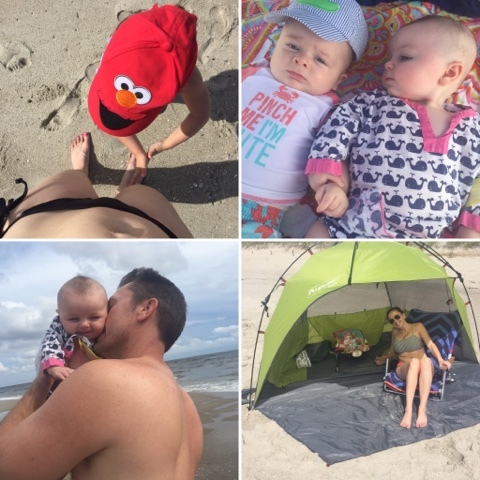 Charlotte and my nephew Thompson aren't old enough for sunscreen, so we'd take them down to the beach and immediately put them under shade. Laura brought her bouncer (like this one) which was so smart to have under the tent. She and I used different tents, and I don't think she'd recommend hers ... it broke! The one that we used was so awesome and easy to put up and take down. One morning I took both Camille and Charlotte down to the beach all by myself (Ian had to drive back that day for work) and put the tent up solo -- if that tells you how fast and easy it goes up. I was using the Shade Shack which is on Amazon here. Highly recommend. You also use sand to weigh it down so it's just one piece to put up, and it collapses like those pop-out sun deflectors for your front windshield. 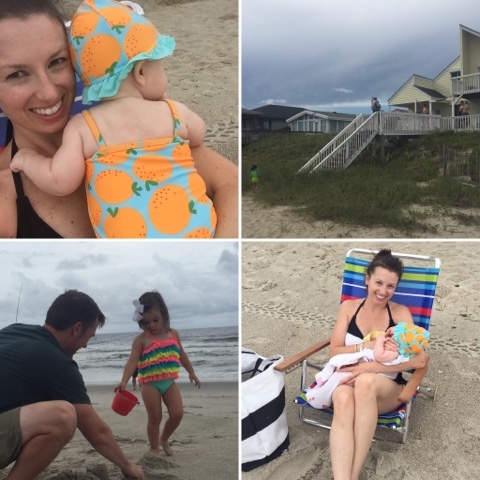 Other than that, we had some good late-afternoon beach trips when the sun wasn't out so that we could have the babies out safely. For meals we aimed to be at a restaurant by 6/6:30. Not the easiest when your family is more of an 8/8:30 dinner family on vacation, but everyone understood. 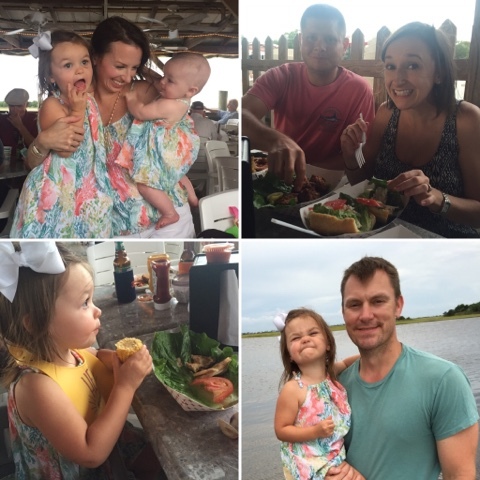 We drove into Southport (about 25 minutes) for dinner at Provision Company one night. This was a highlight. You stand in line to place your order, grab your bevvie of choice from a refrigerator, then go sit at a table on a covered area outdoors. At the end of the meal you walk up to the counter and tell them what you ate and how many beverages you consumed and pay. Honor code style, love it. I had the dozen steamed clams and crabcake. Oh ... and a much-appreciated glass of pinot grigio! We also had two good meals at Pirates Deck, a great lunch at Shagger Jacks, and wonderful donuts for breakfast one day at Ahoy Donuts. All of these spots are on Oak Island. Relaxing on the beach wasn't exactly in the cards this year, but it will get easier. I did read about half of The Good Girl by Mary Kubica and am really enjoying it. We brought board games and didn't really play them -- but two nights we did play Left Right Center which is an awesome beach game. 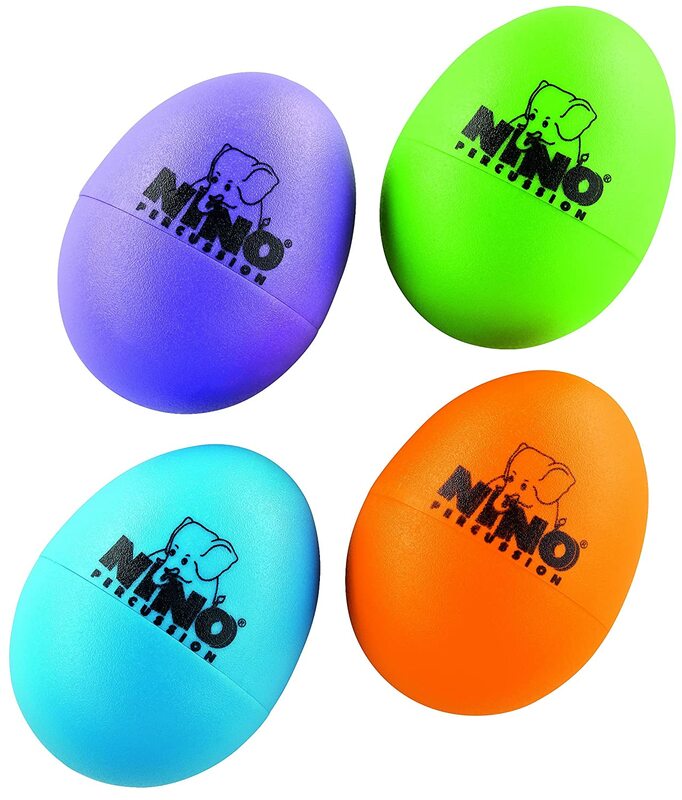 Takes up no space in your bag, and all you need is three dollar bills to play! Charlotte slept in a rock and play in the closet in our room. She's just getting to that point where it won't be safe for her to sleep in it much longer, so this was the last hurrah. Camille slept in her OWN bedroom in a twin bed which was wild ... Ian brought his big foam roller along and we put it under the fitted sheet so she wouldn't roll out. It worked! We split up the cooking so that each couple planned out a dinner one night. For our night, we did enchiladas with yellow rice and baked avocado halves. Mom and Dad's night -- crockpot chicken thighs with roasted okra and green beans. Laura and T's night -- meatball subs, yum! We did a few grocery store visits, but prior to the trip Laura emailed out a list for each of us of items to bring (paper plates, cleaning products, condiments, food staples, you get the drift) so that we didn't have to do a ton of shopping on the island. So there's our trip in a nutshell! We had an awesome time and came back maybe one slight shade darker and a smidge more relaxed. Next year, I can't believe that I will be chasing TWO little girls around on the beach! 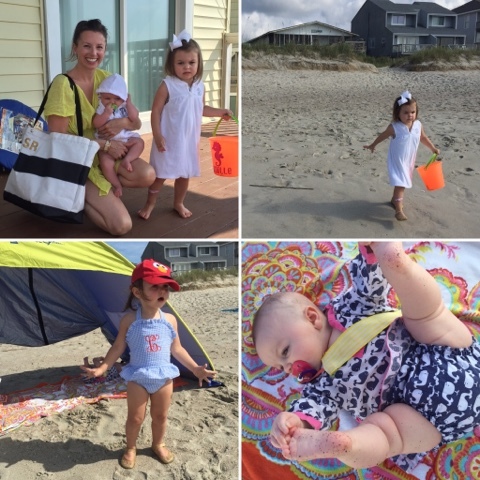 We are officially back from the beach and settling back into our normal life in Charlotte. As great as it is to escape to the beach for the week, there is something so comforting about being HOME ... a dose of reality. We returned home to three loads of laundry that needed to be run ... really what should have been about six loads, but I was jamming that washer full with every bit I had! So now I have a mountain of clean laundry to fold and put away. Camille has ballet this morning and two days of preschool this week. I have returns to make to Homegoods and a meeting with Home Depot about potential plantation shutters in our home. I have a feeling they will be out of our price range, but may as well get a quote. Thursday: I host supper club here and still need to come up with a fall themed menu and complete the shopping! We don't have any weekend plans so I am hoping either Friday or Saturday we can just lay low and order a pizza. Camille and I have just finished our bowls of cereal and I am going to put the girls in the double stroller and take them for a little morning walk. Hope your Monday is off to a great start. What was the highlight of your weekend? 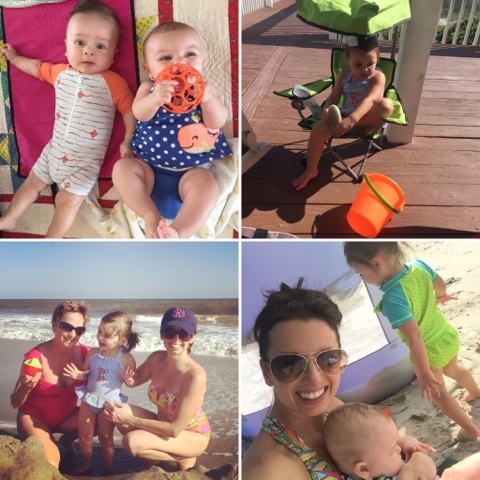 For today's Five on Friday, here are five snapshots from this past week at the beach! We are having a great time and eating well, no question about that. 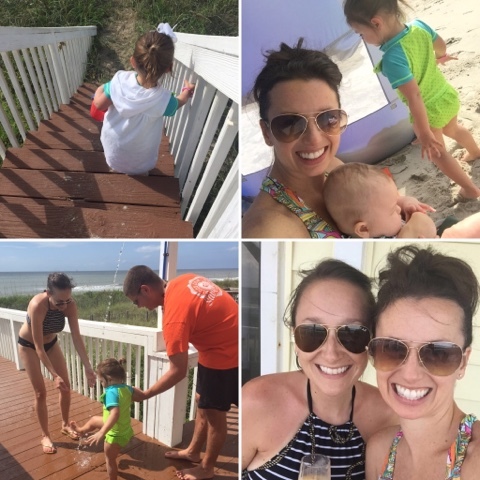 I will be back next week to share some of our favorite finds from Oak Island Beach and some other posts about recent skincare/beauty purchases and some toddler activity ideas for the fall. First day of fall is next week ... what!? Oh! And I'm hosting a fall-themed Supper Club on Thursday night, so if you have any great autumn recipes, I'm all ears. Happy Friday to you all and thanks as always for linking up with us! This week we finalized a big re-do in our kitchen ... we had the kitchen cabinets repainted! They look so awesome. I ended up switching out the Galveston Gray color for Chelsea Gray. It's a hair darker and I don't regret it at all. I was in a home decor store about two weeks ago and heard a decorator say "Chelsea Gray" and I just felt like it was a sign. Or at least, if it was good enough for a decorator, then it's great for me! :) Can't wait to share photos soon ... the before and after is pretty awesome. 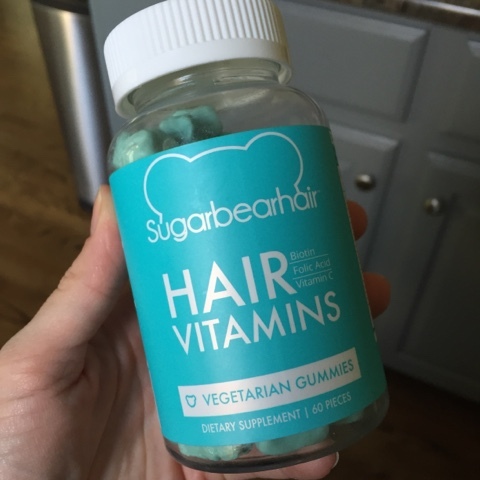 I bit the bullet and ordered SugarBearHair vitamins from Amazon (find them here). Just like I did a few months after having Camille, I am losing handfuls of hair like it's my J-O-B. 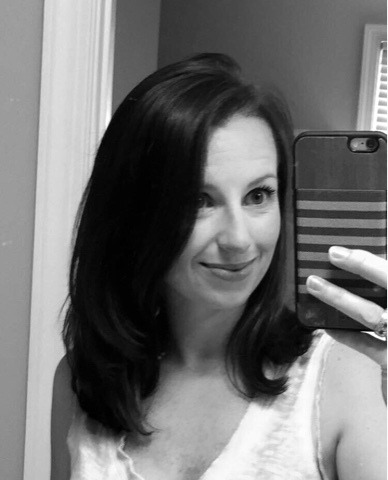 Postpartum hair loss, for me, is the worrrrst part of pregnancy. It's just so depressing to blow-dry my hair knowing that my fingers are going to be laced with hair at the end. And I'm vacuuming my bathroom floor on the daily. I've heard rave reviews about these vitamins and have been taking them for nearly a week. Hair loss has slowed already; coincidence or not? I'm excited to keep taking them. 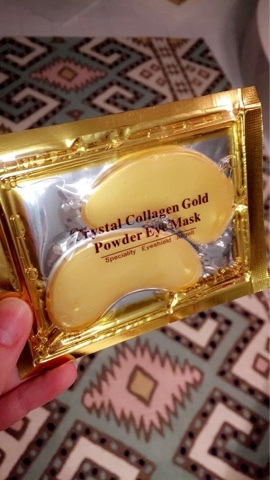 On another beauty-related note, I purchased these gold collagen eye masks and was amazed at how inexpensive they were. Who knows if they're baloney or if they actually work, but I do feel pretty glamorous walking around the house on a Friday night with shiny metallic patches under my eyes! Spa night! 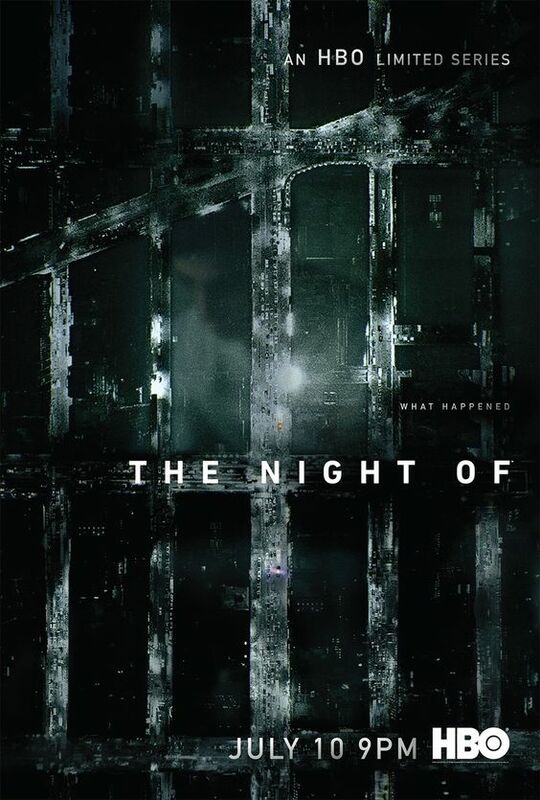 We haven't had much time recently for TV (I'm seriously wondering if we should have held off on getting cable at all for the time being, until everything slows down a bit) but one series we are slowly making our way through and enjoying is The Night Of. Anyone else watching? It's on HBO. A nice weekend mantra! Well, a nice life mantra in general. 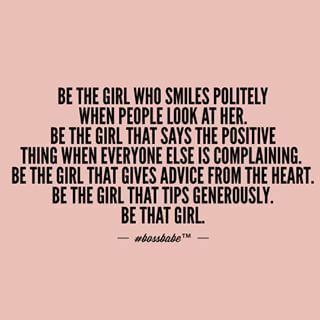 Enjoy a beautiful weekend and be #thatgirl! Our beach trip is quickly approaching and I started packing last night! I'm typically a procrastinator, but with two wee ones, it definitely pays off to pack in advance. I'm corralling some of our needs like towels and cute beach outfits and sunscreen. Here are some of my essentials! One activity that we do daily is coloring. 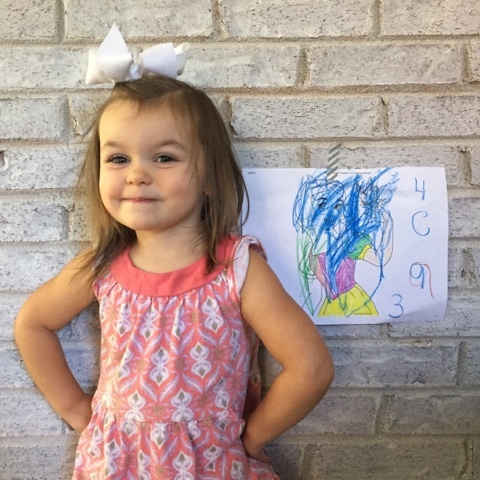 I think it's great for Camille -- she can learn colors, body parts (color the hair brown! color the lips pink! 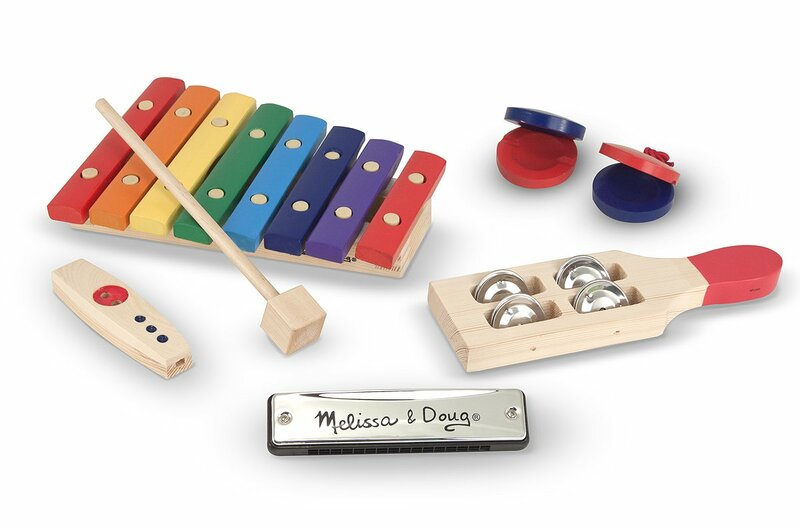 ), hand/eye coordination, all of that good stuff. And it's great for me ... how else do you think this blog post is getting written? Yep, she's coloring in her high chair as we speak! We typically transition straight from breakfast to coloring. So she stays in the high chair and I just swap out her cereal bowl for a coloring book and tupperware of crayons. Coloring books from the dollar store are our favorite, but I also have had a fun time printing pages for free that you can find online. Just google "free coloring pages" and you'll be amazed at what you can find. 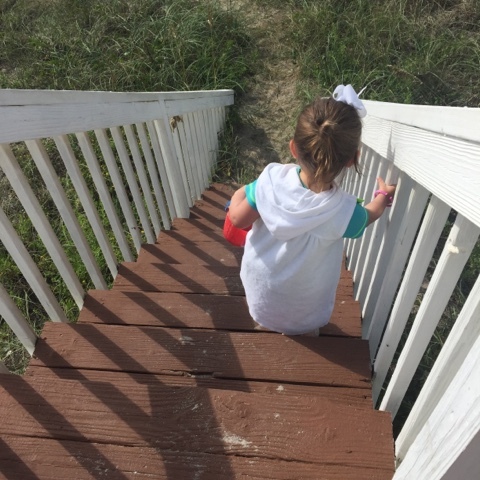 We have an upcoming beach trip, so we've been doing lots of beach scenes recently to get Camille pumped for it and familiar with sand castles, pails and shovels, shells, the whole bit. Ian has also printed out some Halloween pages for her already. Never too early to get that started, ha! So, maybe I've come to the conclusion that I am not in the stage of my life that includes lengthy, expensive, professional haircuts. It had been five months since my last chop (yes, before Baby Charlotte's birth!) and I just couldn't find the time to make an appointment for a cut with my normal guy. Yesterday, after leaving a dentist appointment that ended a little earlier than expected, I checked in with my mom -- who had driven to town to be with my girls -- made sure all was going well, and then I pulled a quick turn into the Great Clips around the corner and got a $14 haircut that only took about 10 minutes. It was worth EVERY single penny. Quick, no-muss, no-fuss, and I had 5.5" taken off! My hair feels SO much healthier and bouncier, and I even saw that after 6pm the haircut price drops to $9.99. Sign me up. I'm dead serious. We have a beach getaway coming up and I just ordered this adorable Lilly dress last night from ThredUp! I hope it fits, can't wait to get it in. 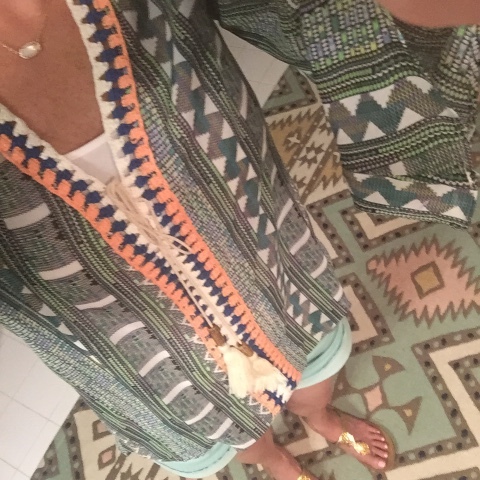 My ThredUp referral link (here) wasn't working recently according to a few of you, so I'm not sure if you got your $10 for free to the site. If you attempted to use it and didn't get your first $10 free, please message me. I'll let them know so that they can credit your account! Check out my little ballerina. 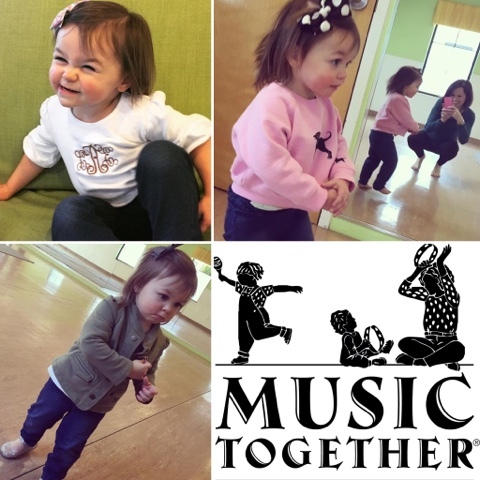 Monday classes are the cutest highlight of our week! I took classical ballet until I was 17. I would love it if Camille stuck with it as well. :) She's doing a great job and you know I made her a hairbow to match her leotard. 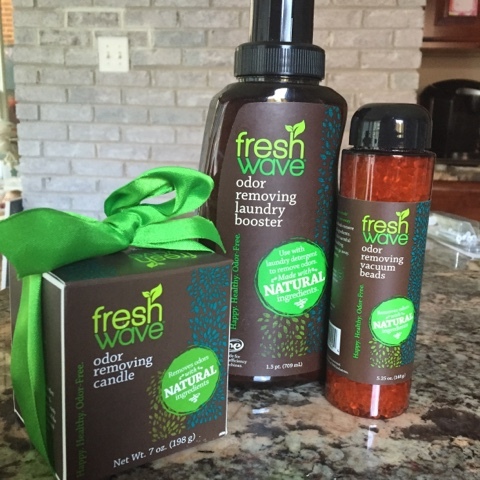 The lovely folks from Fresh Wave sent me some new goodies, perfect for our new home! This is actually a line that I really enjoy, especially with the little girls in the house. 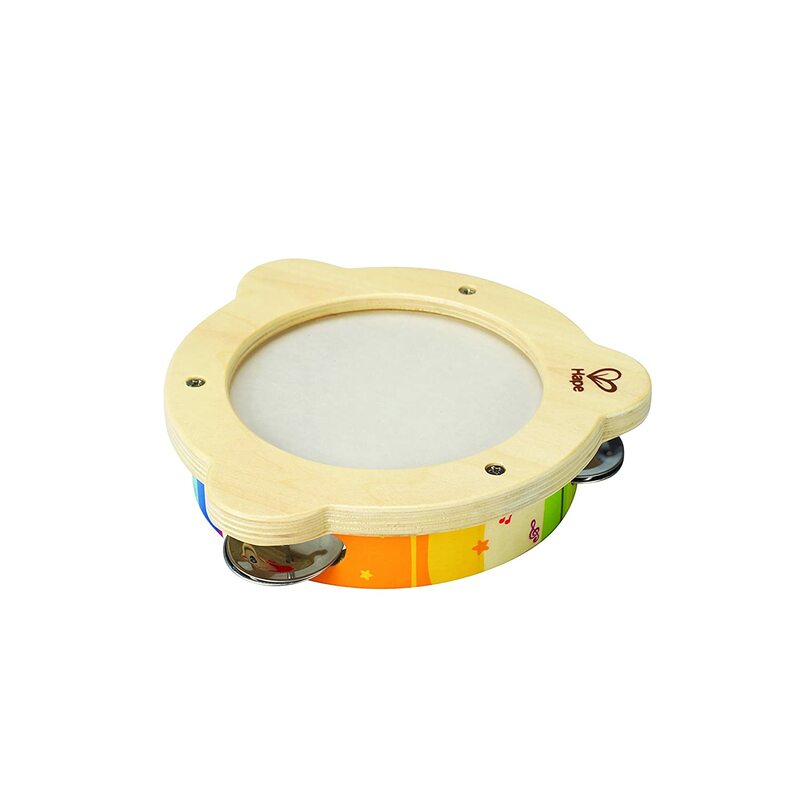 You may remember that one of my favorite items they make are the odor removing packs which I drop down inside our diaper pails. You can find those packs HERE at Target.com. Lastly, a great reminder for us all this Friday! Hugs to you all, friends!